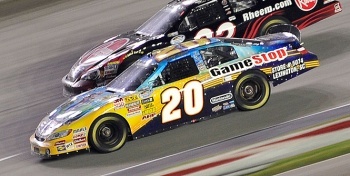 A Super Mario Galaxy 2-themed car proved to be a good omen for NASCAR racer Joey Logano, who claimed victory yesterday in the NASCAR Meijer 300. Early last week, we reported that Nintendo's iconic plumber would be adorning the No.20 car of driver Joey Logano in the upcoming Meijer 300 race on Saturday, June 12th. Well, those amongst you with a sharp mind (or a calendar) may have noticed that Saturday, June 12th was in fact yesterday. Joey Logano became the first NASCAR driver in history to win three races at the Kentucky Speedway in a row when he triumphed in the Meijer 300 yesterday, all the while bearing the image of the videogame superstar (and his trusty steed Yoshi) soaring through space on the hood of his car. While Logano attributes his threepeat win to an excellent knowledge of the Kentucky Speedway track from countless hours of practice, you and I know better: NASCAR authorities are investigating reports that Joey Logano may have used Power Stars and Red Shells during the race to assure his victory.